The healthcare system in Poland suffers from some inefficiency in its organization, functioning and financing. In order to implement comprehensive change management in healthcare sector, the Polish Ministry of Health has been working for the last three years on the “Healthcare needs maps”, that aim at creating a tool and a process appropriate to develop public policies at national and regional level based on evidence coming from reliable data. The stochastic analysis and projection of healthcare needs will be a basis for contracting process of National Healthcare Fund and public investments. The Healthcare needs maps are a condition sine qua non for receiving the EU funding for healthcare sector. Healthcare needs maps enable identification of inefficiencies in the system and planning of prevention actions, healthcare services provision and investments adjusted to demographic and epidemiologic trends. To implement evidence-based policy making and enable modelling system performance and optimum shape of delivery net it is crucial to extract, count and present the data in an appropriate way and give it an appropriate meaning, what can be achieved only in cooperation with medical experts. Maps present values for over 1000 input, output and outcome indicators, separately for individual hospitals and concerns nearly 300 disease groups. Ministry leads the project to better coordinate the wide range of stakeholders but have never been meant to be institutionalized and forced down by the central administration. This is why so many concerned parties are involved in the process and the results are being consulted so widely. The healthcare system in Poland, likewise in other countries, suffers from some inefficiency in its organization, functioning and financing. Many attempts to improve the situation are being undertaken now and then, but without a broader, objective overview and systemic approach. The most common result is that improvement in one field results in unexpected complications in another. In order to implement comprehensive change management in healthcare sector, the Polish Ministry of Health has been working for the last three years on the “Healthcare needs maps”, that aim at creating a tool and a process appropriate to develop public policies at national and regional level based on evidence coming from reliable data. The stochastic analysis and projection of healthcare needs will be a basis for contracting process of National Healthcare Fund and public investments. 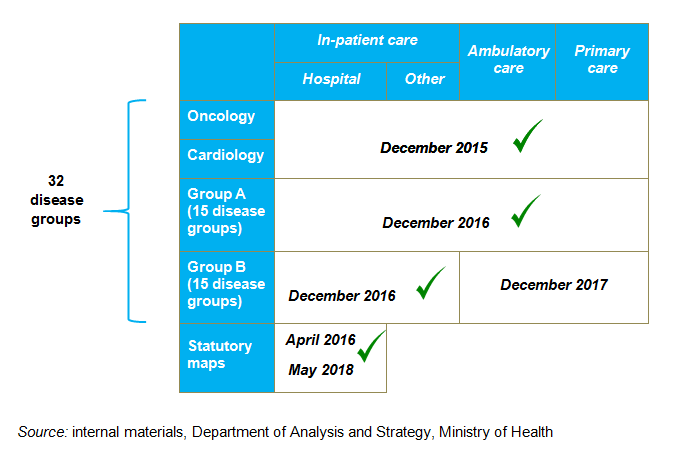 What is more, the healthcare needs maps are an obligatory condition for receiving the EU funding for healthcare sector. services providers undergo the same systemic and efficiency analysis in order to grasp a bigger picture of phenomena occuring on the voivodship and country level. This tool supports evidence-based management in the healthcare system, in terms of both ensuring durability of actions (partial independence from the political process and making decisions based on objective analysis) and supporting the process of explaining social policy to the stakeholders, especially to the citizens, which is more difficult in the area of healthcare policy than in other social policy sector. The projects’ goal beside resolving the abovementioned, was to deal with two systemic problems retarding the possibility of efficient reforms of the health system. First of them is the lack of liaison between the expert medical knowledge and statistical, mathematical and analytical analysis. To implement evidence-based policy making and enable modelling system performance and optimum shape of delivery net it is crucial to extract, count and present the data in an appropriate way and give it an appropriate meaning and understanding, what can be achieved only in cooperation with medical experts. Second one is the scattered and often imprecise (up-coding) or even falsified data about the system, that was hardly possible to be analyzed and needs to be set in order. That is why it was so crucial to ensure that the analyzed data concerning individual hospitals resulted later in a clear information about the voivodships and the whole country – Poland. Healthcare needs maps are conceptualized and created within a complicated process that involves a variety of stakeholders of the system. 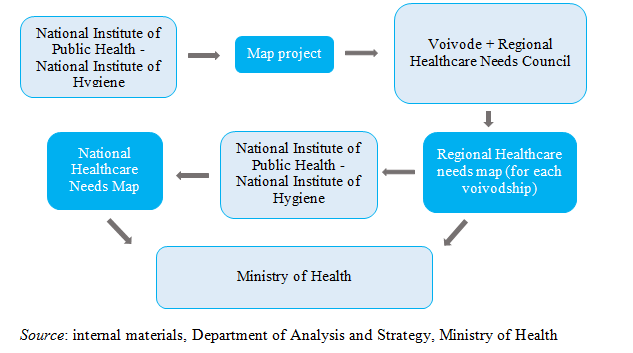 The core work is conducted by Department of Analysis and Strategy of the Ministry of Health, supported by a separate team for each of the 32 groups of diseases (divided on the basis of ICD 10 - International Statistical Classification of Diseases and Related Health Problems) that include national medical consultant in the concerned field and between 3 to 5 medical experts chosen via public procurement procedure, who are being coordinated by two analysts from the Department of Analysis and Strategy of the Ministry of Health. The data extracted from the National Health Fund and other available sources (as medical registries, Central Statistical Office statistics) is being discussed with those experts in order to explain the phenomena occurring in the system, defining and interpreting the indicators that show those phenomena and to identify possible falsification in reporting carried out by the healthcare units (what is often the result of the up-coding problem). The project is held by the Ministry of Health only to better coordinate the wide range and variety of stakeholders in the system but have never been meant to be institutionalized and forced down by the central administration. This is why so many concerned parties are involved in the process and the results are being discussed and consulted so widely. A number of regional conferences to collect information on the mapping process directly from stakeholders have been organized, as well as participation in international conferences to gain knowledge on good practices, allowing for possible corrections in updated map versions. Furthermore, the healthcare needs maps have been widely consulted during dozens of meetings with consultants and experts from all medical fields. The biggest part of meetings took place in two rounds - at the turn of August and September, and November and December 2016. This was the first such wide-ranging discussion about the health needs of Poles. Over a thousand experts took part in it. 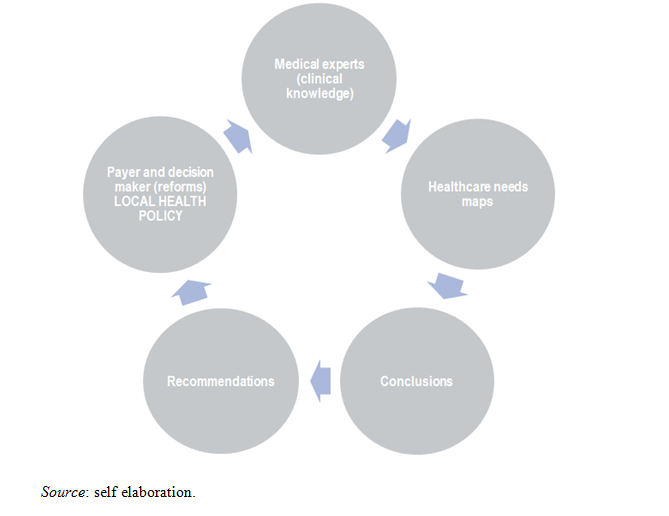 Involvement of various stakeholders at different stages of map creation helps to draw more objective conclusions which will further translate into recommendations, and these into decision of the payer and the decision maker (understood broadly as the central administration – the Ministry of Health, local administration – the City Halls, hospitals and other providers) and the formation of local health policies. Their practice will provide new data for analysis in subsequent maps (both the new values for what already have been analyzed in previous maps and new indicators whose monitoring will be useful and justifiable). As the healthcare services providers will see that the conclusions from the healthcare needs maps are actually being implemented, we hope the new reported to the system data will become each time more reliable and precise. This cycle will be constantly repeated, aiming at optimizing the health care system. • until the 31st of May 2018 (maps will be in force between the 1st of January 2019 – 31st of December 2021 and they will be an updated versions of the maps published in 2016). After this transitional period, the obligation to coordinate the preparation of documents will be transferred to the National Institute of Public Health - National Institute of Hygiene. Every five years new maps will be issued, updated annually with new values extracted from the data bases. The Institute will create a map project based on the received demographic, epidemiological statistics together with data coming from the register of medical entities, and then transfer it to the voivode. Based on this document, followed by consultation with the appropriate Regional Healthcare Needs Council, the voivode will create a Regional Healthcare Needs Map for the concerned region. In the next step, based on voivodship maps prepared by the voivodes, the Institute will create a National Healthcare Needs Map. The whole set of documents will be finally approved by the Ministry of Health. In addition, the abovementioned maps for 32 groups of diseases are being prepared within a project financed by an ESF operational programme Knowledge Education Development. According to the article 19 sec. 1 of the Act of 22 July 2014 amending the law on publicly-funded health care services (Journal of Laws 2014 item 1138) and some other acts, the date of publication of the first edition of maps, prepared after the transitional period by voivodes, in force for the period January 1, 2022 - December 31, 2026, was set on February 1, 2021. As the resources required to fulfill the law provisions are very demanding in terms of analytical personnel able to work on enormous data bases, Department of Analysis and Development took upon itself the effort to prepare as much as possible before the National Institute of Public Health takes over the process. The first maps were already published in December 2016, for each voivodship 70 types of hospital wards were analyzed (16 times around 1,000 pages publication). We want to assure they continue the work on an already identified set of indicators, they will only widen if necessary. It clearly shows that the work of the Department of Analysis and Strategy is undoubtedly an investment. The statutory, so called “hospital maps” (analyzing the functioning of specific hospital wards) are completed by the healthcare needs maps based on a matrix of 32 disease groups analyzed in in-patient care, out-patient care and primary care levels. The indicators built for disease groups can give deeper comparison between the patient pattern and output/outcome of the ward. Analyzing patient paths could be the basis for switching between hospital care to ambulatory care. Maps are designed to provide all concerned stakeholders with a reliable information on a set of quantitative data with regards to hospitalization and out-patient care statistics. • healthcare needs forecasts (to the level of each voivodship in terms of incidence and hospitalizations). The maps include around 55 non-specific indicators, the same in each group and subgroup of diseases, such as number of hospitalizations (total) per category of disease, number of incidents per region (per voivodship), number of registered incidents per 100 thousand of population per region (voivodship), structure of registered incidents per 100 thousand of population per region (voivodship), age group, residence and many other highly specific statistics showing the current state of the system. In addition, there are between 8 and 15 specific indicators, applicable to a specific group or subgroup of diseases, such as the number of amputation of diabetic foot unpreceded by intravascular intervention, number of patients undergoing thrombolytic treatment in case of an ischemic brain stroke etc. The set of indicators was defined by medical experts on the basis of clinical practice and discussed with national and regional medical consultants (see below). Altogether it gives around 360 indicators for each group, with specific values indicated for every hospital in which the given disease is being treated. The key to success in analyzing such a broad data base and continue this process in the future (data comparison in time horizon) was the establishment of a common “dictionary”. In order to conduct reliable analysis of the data it was crucial to come to a coherent understanding of diseases and procedures. 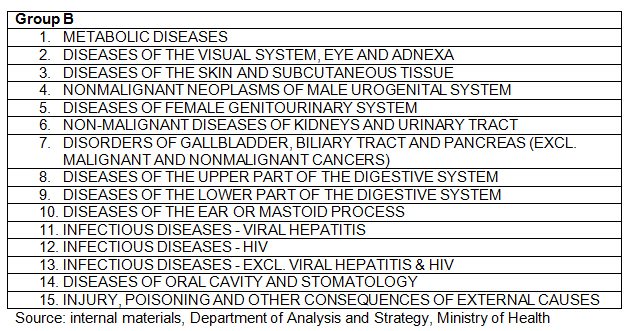 In order to do that each of the 32 groups worked on the homogenous subdivision of diseases and matching them with the appropriate codes (accordingly with the ICD 10 - International Statistical Classification of Diseases and Related Health Problems) and procedures (ICD 9 - International Classification of Medical Procedures). The medical experts and analysts needed to operate in the same language that would enable to match the medical and statistical and mathematical knowledge. It was the medical experts role to navigate the analysts through the intricacies of clinical experience so they would know how to search for data and how to read it. It is crucial for the transparency and reliability of the process as there are over 300 subgroups of diseases analyzed separately. Those and other models and interesting observations will be elaborated on in upcoming publications on which are working together the medical experts supporting the whole mapping process with the analytical support of the analysts from the Department of Analysis and Strategy at the Ministry of Health . According to the cycle explained earlier in this article the data presented and analyzed in maps gives us the source to draw conclusions. Based on them we are currently working on recommendations for specific areas, that we will soon be presented to the medical experts and other stakeholders in the system in order to obtain their opinions and approval. After having agreed upon the recommendations it will be crucial to come up with specific tools and plans that will enable us to reach the outlined goals. Moreover maps will be followed by the development of other advanced models. First will focus on medical staff availability, consisting of supply and demand modules, which will allow to more accurately determine the number of physicians needed in each specialty, in response to the changing demand for services. Second one will analyze the availability of medical infrastructure in particular voivodships based on the analysis of the status quo and the predicted consumption of services. The last among them will concentrate on patients' comorbidity, which will allow for a more accurate definition of hospital ward burden on patients with more than one disease. In order to optimize the shape of the healthcare needs maps and exhaust the use of knowledge gained during their development, up to 2019, the updating and refinement of the documents will involve extending the indicators and analysis developed during the process. The whole initiative will allow the focus on two key aspects of the effectiveness of the health care system, namely the current availability and forecasted need for health services delivered to individuals and the monitoring of the quality of their delivery. As the project serves public purposes, we are currently in the process of creating a tool, an interactive platform, where interested and registered healthcare services providers as well as other stakeholders will be able to search for information and generate data report. As for now, we publish the healthcare needs maps on our website: www.mpz.mz.gov.pl. Finally, all the above mentioned will be accompanied by conferences at the national and international level promoting the idea of healthcare needs mapping itself but also its Polish realization. In the long term we are hoping that the process will become a permanent and appreciated part of the system and will enable its continuous improvement. Act of 27 August 2004 on publicly-funded health care services (Journal of Laws of 2015, item 581). The full text of the regulation is available at: http://isap.sejm.gov.pl/DetailsServlet?id=WDU19970280153. Accessed on 27.07.2017. Act of 22 July 2014 amending the law on publicly-funded health care services (Journal of Laws 2014 item 1138). The full text of the regulation is available at: http://isap.sejm.gov.pl/DetailsServlet?id=WDU19970280153. Accessed on 27.07.2017. 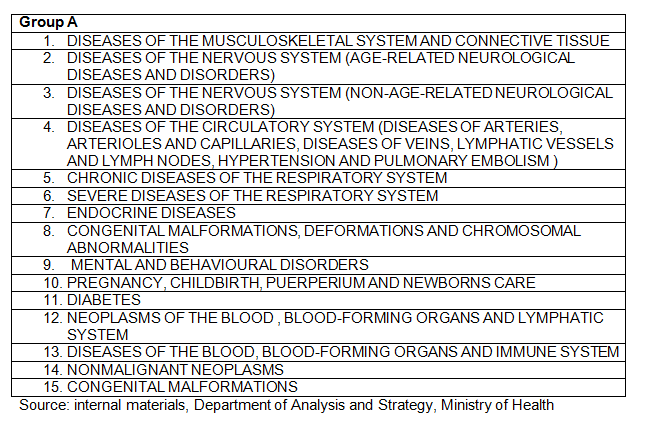 Ordinance of the Minister of Health of 26 March 2015 on the content of healthcare needs maps (OJ 2015, item 458). The full text of the regulation is available at: http://dziennikustaw.gov.pl/DU/2015/0458. Accessed on: 27.07.2017. WIĘCKOWSKA B., Medical treatments in Poland – analysis and models, Volume I: Oncology; Medical treatment in Poland – analysis and models, Volume II: Cardiology;The use of quantitative methods to assess quality of care and demand for service provision in oncology and cardiology in Poland,; all three available to download on http://www.mpz.mz.gov.pl/publikacje/. Accessed on 27.07.2017.